Yesterday around 250 riders participated in the Critical Mass #18 in Skopje, Macedonia. 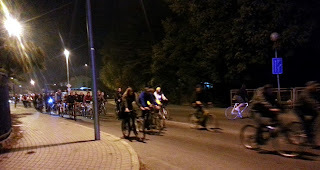 We started from the parking lot in front of the "Boris Trajkovski" Pool, and did a route of around 10 kilometers. 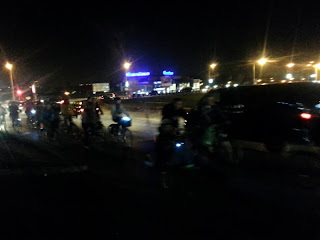 This Critical Mass was more challenging, since it was a night ride and it traversed streets with only one lane in each direction and significant traffic. We had two incidents of impatient drivers who were determined to overtake the group and pushed into the bikes to avoid incoming traffic. 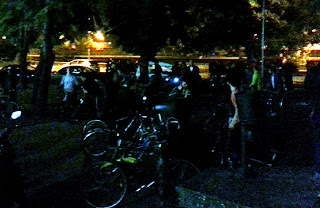 Again, it was a very colorful group, including some very funky looking bikes (I saw at least one recumbent bike and several very retro designs). 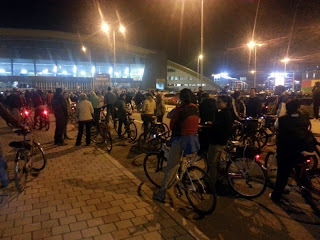 The ride ended in front of the Youth Cultural Centre. Appologies for the poor quality of the last photo, but the approach to the Youth Cultural Centre is pitch black.